After the 2016 season, they were both finalists for the Offensive Rookie of the Year. Heading into 2018, Dak Prescott and Ezekiel Elliott are among the league's favorites to win the "Most Valuable Player" in the NFL title. Of course, many players are counted as "favorites" since we're talking about individual players, from which there are many in the NFL. Naturally, the top 17 is made up by quarterbacks. The fact that the MVP goes to a quarterback just about every year is the reason why. Only 15 quarterbacks are ahead of Dak Prescott on the list. Prescott shares the "30/1" odds with Andrew Luck and Matthew Stafford. 2017 Dak attracted a very different public opinion than 2016 Dak. During his rookie season, he managed to take care of the ball and play well enough to lead his team into the playoffs. He earned tons of respect by winning a shootout against Ben Roethlisberger, winning an overtime thriller versus the Eagles and even tying the game in which they were behind versus the Packers in the playoffs. Dak should still be able to do all of that with some help from his offensive line (which happened to collapse at times last year, especially when Tyron Smith was forced to sit on the sideline) and his premium running back, Ezekiel Elliott, was suspended for six games. If Dak throws for more than 30 touchdowns and runs for another handful of scores, he'll likely be in the MVP conversation. Considering the team he plays on, and the fact that he'll be throwing to a set of receivers that are mostly new to the team, he'll give people tons of good things to talk about. As for Ezekiel Elliott, we all know how special he is. Only 22 players are listed ahead of Ezekiel Elliott on the MVP favorites list. What is very surprising is that Le'Veon Bell, Todd Gurley and even David Johnson have better odds than him. I don't know about you, but I truly believe Ezekiel Elliott is a Top 3 running back and arguably better than some of those players. Not only "better", but the Steelers have Antonio Brown, the Cardinals have Larry Fitzgerald while Elliott is the Cowboys' best (maybe the only) proven play-maker on offense. Of course, winning the MVP as a running back is tough. The last time a non-quarterback won the award was when Adrian Peterson ran for 2,097 yards in 2012. However, Zeke is one of those guys who can cross the 2,000 yards mark and if he does, he'll definitely be in the conversation as long as the Cowboys are winning games. Logically, many players on the list seem to be more likely to win the award than the two young Cowboys. It's crazy to predict which player will win it in June! However, if America's Team bounces back and is able to have a similar season to 2016 but slightly better from a stats perspective, don't rule any of these two guys being significant contenders for the MVP title. 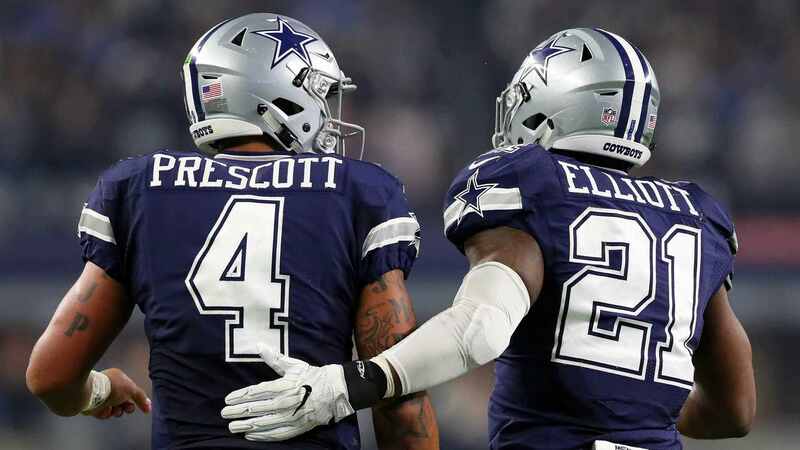 Tell me what you think about "MVP Favorites: Dak Prescott and Ezekiel Elliott’s Odds Among NFL’s Finest" in the comments below, or tweet me @MauNFL and let’s talk football! If you like football and are looking for a Dallas Cowboys show in Spanish, don’t miss my weekly Facebook Live! show, Primero Cowboys!